It might be asking too much for Hawick fans to feel some sympathy for Melrose but the simple fact was that in losing four key members of their pack both before and during the match, the Greenyards men were not the force they should have been. On Saturday Morning Melrose’s Scotland under-20 lock Lewis Carmichael was called up as a stand-by for Edinburgh ahead of the capital’s game against Munster. Then halfway through the first half Carmichael’s regular second row partner James Head was stretchered off with a neck injury. If that were not bad enough the Melrose vice captain Grant Runciman was then forced to retire with a head wound and towards the end of a costly first half Nick Beavon, the influential tighthead, sustained a broken bone in his hand, an injury that is likely to result in a two month absence from the game. “There’s no getting away from losing Lewis Carmichael. We could have stomached that but then we lost James Head in the first half. And that was key,” said the Melrose head coach, John Dalziel. “We looked really comfortable in the first half and they looked like the ones who were rattled. They lost key players as well. But it wasn’t a game for the backs. Hawick suffered through injuries to their midfield playmaker, Rory Hutton and later to their stand-off, Lee Armstrong. But on a day when summer conditions came to an end, what mattered was forward strength and in being able to field both Scott McLeod and Simon Berghan, Hawick had the trump cards. 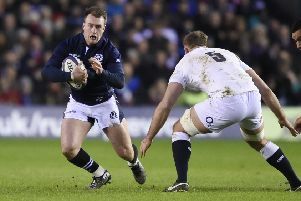 36 year-old McLeod, capped 24 times for Scotland, made his experience count, most crucially with two line-out ‘steals’ on the five metre line when Melrose threatened to hit back in the final quarter. At the end of an absorbing first half Melrose led 6-0 after Joe Helps had succeeded with two goals from four attempts. Hawick’s only chance for points fell to Ally Weir but the full back’s kick was short of the posts. Weir quickly atoned with an early second half penalty before converting his own try after Bruce McNeil had surged off the tail of a line-out, to put Hawick in the lead for the first time in the match. Melrose threatened with a series of penalty-created line-outs but McLeod’s intervention and then a break-out by Sean Goodfellow ended with Weir kicking a second penalty goal. McLeod then was shown the yellow card but Melrose could not make their numerical advantage count, and when Weir nailed his third penalty kick six minutes from full time Hawick effectively sealed their win.